At Luminous Weddings, we'll get acquainted with the bridal couple before we even take our first photograph. Our professionals learn about couple's personalities and what they value most. We'll speak with you during a private session. You'll meet your assigned photographer. They'll learn about your personal history, love stories, families, and friends. This session will help us tell the real story behind the personal moments. Before a couple weds, the man asks for a woman's hand in marriage. This initial step is the vaak daanam or betrothal. The prospective groom, called a Brahmachari, sends his relatives to approach the woman's family. They ask for her hand in marriage. The prospective bride must belong to a good family and have great character. The maiden's family examines the groom's background. They make sure that he is a good, honest person that knows the Vedas. The woman's father agrees to the marriage request if the man passes the test. The couple completes a Lagna Patrika, a written agreement to complete the ceremony at a future date. The couple does not become an official bride and groom until the eve before the wedding. Luminous Weddings doesn't believe in taking staged or canned shots. We strive to take authentic, beautiful moments. Our professionals capture special moments that happen naturally. You'll receive striking, documentary-style pictures that tell a unique, compelling story about your wedding day. 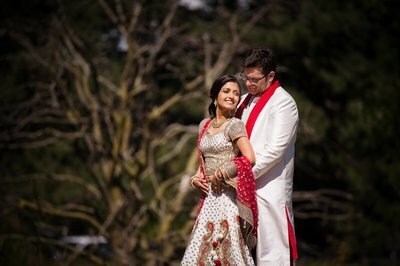 You'll view the touching moments when the bride first arrived at the mandap and the couple walked around the ceremonial fire. We'll photograph each beautiful ceremony. We won't miss one moment. The Mehendi Ceremony is an important tradition that occurs before a Hindu wedding. The bride's friends apply intricate henna designs to her hands and feet. The artwork is not merely for decoration, it helps calm the bride's nerves. Mehendi is one of 16 adornments that a bride must wear. According to some traditions, the bridal party hides the groom's initials among the tattoos. He must search to find it on his wife's body after the wedding. After the ceremony, the maiden cannot step foot outside of the house until her wedding day. Hindu families hold purification rituals and prayers on the morning before the wedding ceremony. They wake up at 5 a.m. to recite puja (or prayers that honor deities) for the bridal couple. Some Hindu wedding ceremonies start with a prayer to Ganesha (Lord Ganesh). He is the Hindu god of wisdom. The invocation helps remove all obstacles standing in the way of the marriage. This takes place hours before the wedding. The priest invokes the name of the nine planets during a ritual called the Graha Shanti. The name means peace with the planets. The ceremony works to reduce the negative effects of astrological planets. The priest blesses the couple's marriage. 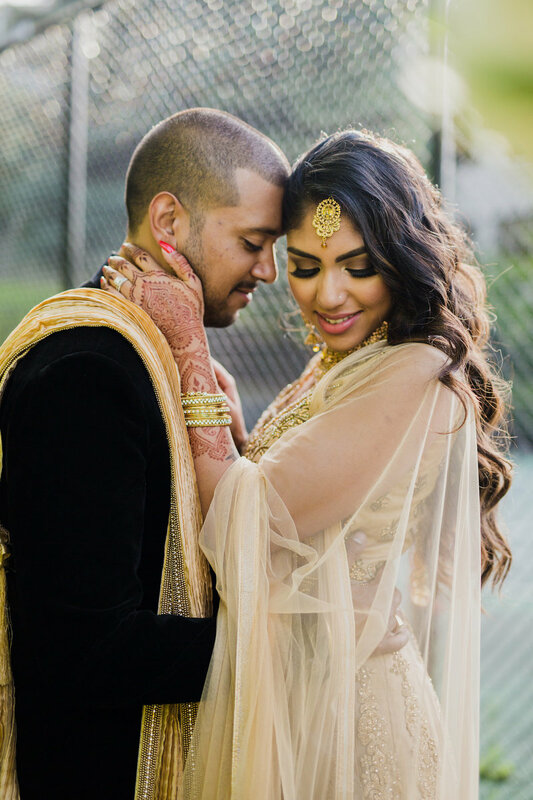 The Vara Prekshanam ritual takes place after the couple has seen one another for the first time on their wedding day. The groom prays to gods Brihaspati, Varuna, Indra, and Surya to erase any doshas (defects) that the bride has. He prays for a long marriage blessed with happiness and children. The gentleman wipes the eyebrows of his bride with darbha grass to chase away defects, then throws it behind the bride. Hindu ceremonies begin with the Achaman observance. The couple sips water. This purification ritual helps bring peace of mind to the pair. The Angasparsha ritual follows. During this ceremony, the bridal couple's limbs touch one another's limbs with blessed water. The Angasparsha brings physical strength and mental alertness. A priest recites mantras during both ceremonies. After the ceremony, Luminous Weddings will develop archival photos or your wedding day in our studio. You'll receive your photographs in an elegant album that's handmade in Italy. Let Luminous Weddings cover your special day. Contact us to schedule an appointment today. Matrimony is a sacrament, or saṁskāras, in Hinduism. Vivāha is the Sanskrit word for marriage. A wedding symbolizes a groom's transition from student to the house owner. The event also marks the bride's status change from daughter to wife. Adherents also believe weddings set the foundation for later life. Hindu ceremonies differ depending on region and sect. The Bengali, Gujarati, Jain, Kashmiri, Marathi, and Punjabi, and, Tamil hold different variations of the basic Hindu wedding ceremony. The Dharma-Shastras, a Vedic text, mentions eight types of Hindu marriages. 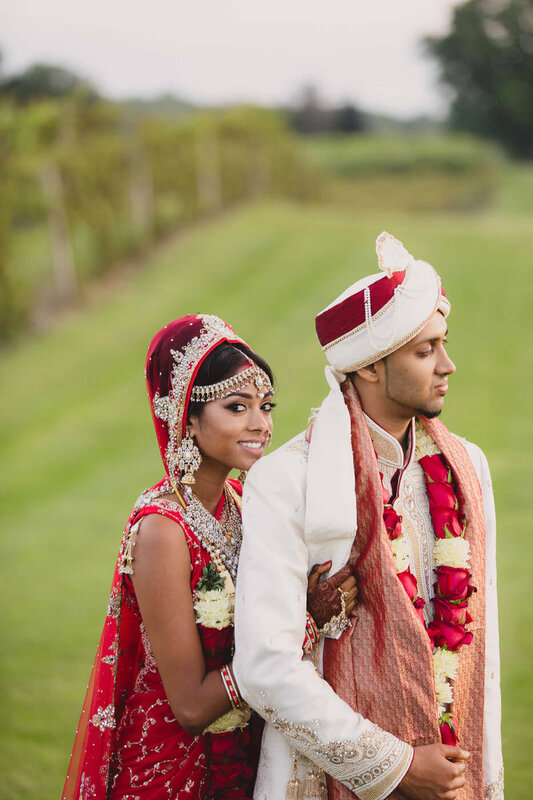 Hindus consider the Brahma Vivah as the best type of marriage. These couples marry after completing their student stage, or Brahmacharya Ashram. In the past, Hindu ceremonies took place over several days. This has changed during modern times. Today, celebrants limit festivities to the eve and day of the wedding. The priest recites two ceremonial prayers. The Kalasha Puja is a prayer for the family's welfare. Next, he says the Punyaha Vachan to ask Lord Varuna (god of sky and water) to purify the matrimonial space. The ceremony helps drive away evil spirits. The groom party's arrival, or Vara Yatra, is a joyous event occurs at the mandap (a wedding canopy decorated with flowers and fabric). Wedding guests greet the group with songs and dancing. The young man wears several lucky materials for good tidings. The bride's parents offer the groom Madhuparka. They make the mixture with ghee, curd, and honey. He recites vows, saying that he hopes that their married days and nights will be honey-sweet with happiness. He pours the mixture into three cups, then drinks it. He repeats a mantra asking to relish health-giving nourishment. His future mother-in-law carries a lamp called an aarti toward him. She blesses the bridegroom with kumkum (turmeric powder). The bride's mother applies a red dot to the groom's forehead called a tilak. She sprinkles akshat rice on his body, then blesses him with both of her hands. The father-in-law greets the groom at the threshold before presenting his daughter to him. Hindus call this greeting the Var Aagamana. 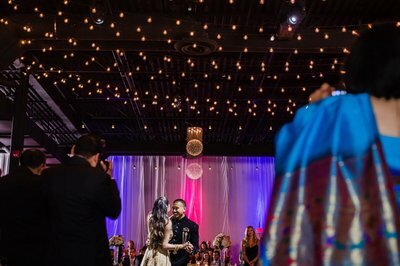 Luminous Weddings will be there to photograph every special moment. The Kanyaa Daanam is a threshold ceremony where the Brahmachari meets his future wife. It is a somber occasion. The ritual marks the change of a bride's status from a single to married woman. The Sanskrit phrase literally means "maiden donation." It derives from the words, kanyaa (maiden) and daanam (donation). The bride's parents present their daughter in marriage during the ritual. 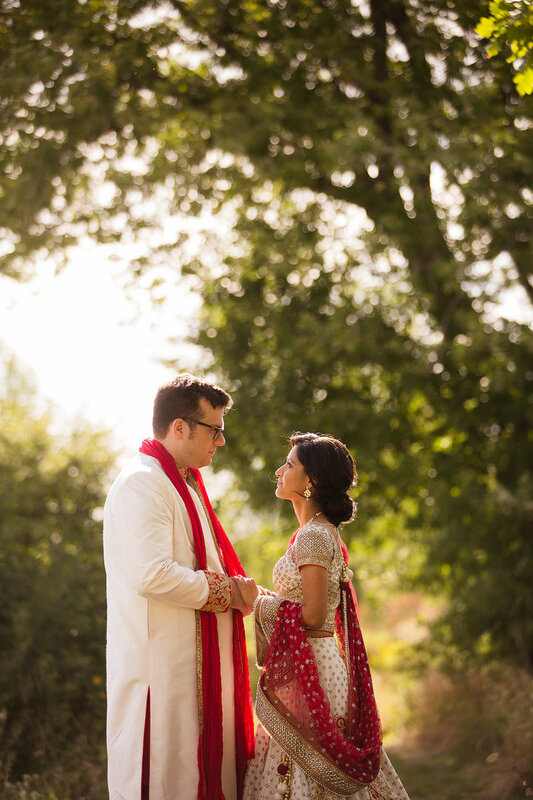 Her father leads her to the mandap where the groom awaits. Afterward, the parents wash the bride and groom's feet with milk and water to purify them. The pair joins their hands, and the bride's father places his palms over theirs. The bride's mother pours water on the trio's grasp. During the Paani Grahanam, the bride surrenders her heart to the groom's hands. The young man covers the right hand of his bride's hand with his right palm. He repeats mantras that praise gods including Bhaga, Vayu, Aryama, Savita, and others. The gentleman prays for a long life, lots of children, and prosperity with his bride. In South Asian regions, couples complete a Jai Mala ceremony. During this ritual, the bridal pair exchange garlands. 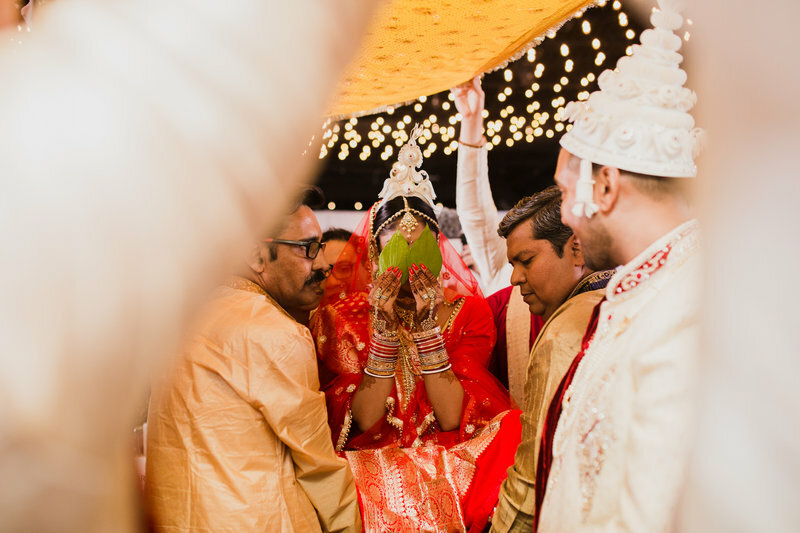 The Hasta Milap is a threading ceremony that joins the bride and groom's hands. A priest recites sacred pujas while wrapping a white thread around the couple's right hands. The thread symbolizes a bond that cannot be broken. The bride's family offers a cow to the groom as a present. In the past, it was a real animal. Today, it is a ring or other symbolic assets. The groom then presents his bride with gifts of clothing and jewelry. He affirms his duty to protect her and give her life's necessities. The priest reads five Veda mantras to prepare the bride for marriage. He asks Lord Varuna and the sun-god, Surya, to prepare the bride for a harmonious life. The husband-to-be ties a darbha rope around the bride's waist then leads next to the sacred fire (Agni). The rest of the marriage ceremony takes place here. The couple sits down before the fire on a mat. The bride takes her seat (asana) to the right of the groom. The groom invokes the gods Soma, Gandharva, and Agni for strength and his bride's youth. The most important part of a Hindu marriage ceremony is the Saptapadi. The circumambulation ritual involves taking seven steps around a sacred fire (Agni). The word literally means seven (sapt) foot (padi). The ceremony is also known by the names Mangal Phera and The Saat Fere. Hindus believe the fire is pure and witnesses the bond. The groom walks with his bride on his right side. The couples hold hands in the same way they did during the Paani Grahanam. The groom helps his wife take seven steps around the fire. After each revolution, they exchange vows that affirm their love, fidelity, and respect for one another. The couple repeats vows called Pheras. They ask for the god Maha Vishnu's blessings. First Phera: The couple asks for healthy food, strength to live together, and respect one another in good and bad times. Second Phera: The couple asks for emotional, mental stability and spiritual support. Third Phera: The couple prays for wealth, prosperity, wisdom, and a peaceful life. Fourth Phera: They ask for the commitment between two souls to increase in love and respect for each other and their families. Fifth Phera: The couple promises to stay with one another through all troubles. They pray for healthy children that have good values. Sixth Phera: The couple asks for a long healthy life filled with joy and peace. Seventh Phera: During the final round, the couple prays for unconditional love, loyalty, and companionship. At the end of the ceremony, the bride shifts to the groom's left side. This act symbolizes that she's closer to his heart. The priest asks the newlyweds to look at the North Star at the ceremony's end. The ritual is called Dhruvadarshan. The celestial body symbolizes a star that is steady and unchanging as it moves through the sky. The priest proclaims their marriage will also be steadfast. The wedding guests hold more rituals to celebrate the couple's departure.